A large pool of untapped energy is right under our feet… or can be. Engineers in the US, as we have reported on Clean Malaysia, have devised a new type of floor that converts your footsteps into renewable energy. Not to be outdone, officials in France have built the world’s solar-powered road that converts sunshine into energy for local residents. Appropriately called Wattway, France’s photovoltaic road surface runs for 1km and is covered in 2,880 photovoltaic panels. Constructed in the region of Normandy, the trial roadway passes through the small town of Tourouvre-au-Perche, where around 2,000 motorists will use it every day during a two-year test period. The solar-powered road will generate enough energy to power all the street lights of the town’s 5,000 people-strong community. Weather permitting (that is to say, if there is enough sunshine), Wattway is expected to produce 280 megawatt hours (MWh) of energy annually at an electrical output of 767 kilowatt hours (kWh) each day, its designers say. Sadly, long and sunny days are few and far between in Normandy, but the project will hopefully lead the way (literally) for similar solar-powered roads around the world. We’re looking at you, Malaysia! What’s the point of a solar-powered road? you may wonder. It’s that solar panels can take up plenty of space and by building them into roads you won’t have to encroach you on fields and meadows. “Wattway produces electrical energy without overtaking farmland or natural landscapes, and contributes to increasing the share of photovoltaic electricity in the energy mix, both in France and worldwide,” explains the French Ministry of the Environment, which financed the project. A downside to the road is the cost. It has cost €5 million (MR23.4 million) to construct, which is more than a dozen times what it would have cost to build a normal bank of solar panels mounted on roofs to provide the same amount of energy. 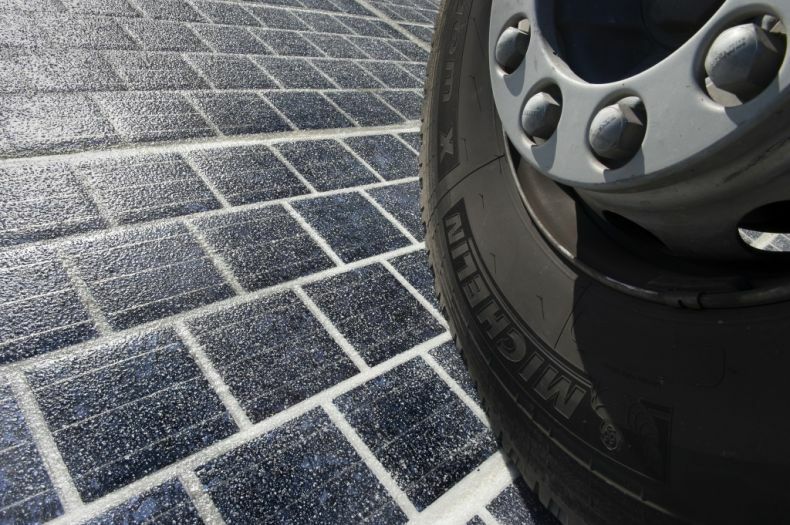 The sky-high price tag is owing to the resistance that has had to be built into the road’s photovoltaic surface so that it can withstand constant pressure from the weight of cars passing on it. That is accomplished by help of a hardy resin containing sheets of silicon. Be that as it may, as the price of solar technologies is on its way down, solar-powered roads are clearly on their way up. French Ministry of the Environment and built by engineering firm Colas, and initial estimates of the power output suggest the Wattway will generate more than enough electricity to run all of Tourouvre-au-Perche’s street lights.The Wattway is projected to produce 280 megawatt hours (MWh) of energy annually, with an estimated electrical output of 767 kilowatt hours (kWh) per day. The Ministry of the Environment says that’s enough to provide public lighting for a population of 5,000, so provided the weather cooperates, Tourouvre-au-Perche’s 3,400 residents should have their nights lit up by the Sun from now on (if you know what we mean).French Ministry of the Environment and built by engineering firm Colas, and initial estimates of the power output suggest the Wattway will generate more than enough electricity to run all of Tourouvre-au-Perche’s street lights. The Wattway is projected to produce 280 megawatt hours (MWh) of energy annually, with an estimated electrical output of 767 kilowatt hours (kWh) per day. The Ministry of the Environment says that’s enough to provide public lighting for a population of 5,000, so provided the weather cooperates, Tourouvre-au-Perche’s 3,400 residents should have their nights lit up by the Sun from now on (if you know what we mean). the French Ministry of the Environment and built by engineering firm Colas, and initial estimates of the power output suggest the Wattway will generate more than enough electricity to run all of Tourouvre-au-Perche’s street lights.